Synopsis: As warden of the north, Lord Eddard Stark counts it a curse when King Robert bestows on him the office of the Hand (chief counsillor to the king, rules when the king is not available). His honour weighs him down at court where a true man does what he will, now what he must... and a dead enemy is a thing of beauty. 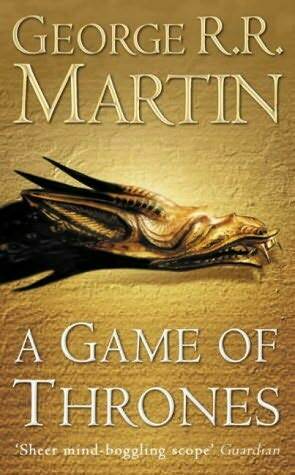 The old gods have no power in the south, Stark's family is split and there is treachery at court. Worse, a vengeance-mad boy has grown to maturity in exile in the Free Cities beyond the sea. Heir of the mad Dragon King deposed by Robert, he claims the Iron Throne. Martin paints a world in which on one side you have Eddard Stark, man of extreme honor, and his family and on the other side the courtiers and their intrigue. The family is thrown right into the middle and noone comes out unscathed, not even the children. King Robert has taken his throne by force, slaying the whole family of the former king except one boy (a prince) and a pregnant woman, who dies giving birth to the last princess of that line. Eddard finds Robert has changed over the years, a substantial part due to the influence of his conniving wife and her family, and doesn't recognize his friend from the past in the decisions he makes. His acception of the position of Hand of the King breaks up his family and we follow them in their different struggles, while also seeing everything through the eyes of the 'enemy' princess, who was raised outside the Seven Kingdoms. With everyone fighting for the crown, it's no surprise people get hurt. If you are a fan of epic fantasy, or any kind of fantasy for that matter, I'd strongly recommend this book to you. It blew me away with its amazing wordlbuilding. It had just the right pace for me. First Martin takes the time to introduce the characters to you and then he starts weaving his epic plot. It changes point of view each chapter, which made me connect with all the characters and come to love them. As the plot progresses, we see not only strong men, but also strong women who truly make a difference, definitely a winning point to me. Martin made me laugh, he made me cry, he made me gasp in horror and astonished me at unexpected turns. In other words: this books goes on my all-time favourites list and I am definitely reading the rest of the series. I give it 5+ bright shiny stars. You know, I like fantasy. I really do. And as per your review this book seems like something I would like. But every time I have tried to read a fantasy book (or sci fi for that matter) I get very angry when the first book doesn't wrap up enough of the story line for me to feel complete. Then I get all angry and never finish the series. So my question before I add this to my TBR is does it do this? Can I read this and feel like the main plot was wrapped up but still gives enough to make me want to read the other? Like Julia, I like fantasy too. And this book was actually recommended to me by someone else not even a couple of days ago. But the problem I have is character introduction and fleshing out this alternative world. Did you find that it was difficult to keep track of characters or the dynamics of this other place? That's a deal breaker for me when reading a fantasy/sci-fi book. Jess - It's a handful keeping track of the characters, but you get the hang of it. I felt that he fleshed out the world quite well, and didn't forget about the plot either - there's a reason it takes Martin so long to write these books! They're very well done. Julia - The Plot is never finished. It's court intrigue, after all. I suppose he does "wrap it up", but at the end, he introduces new plot twists in such a way that you absolutely HAVE to read the next book - not only to find out what happens, but because for you, personally, there is no other option. You get the feeling that there's something WRONG with the world, and the nagging feeling grows the longer you put off reading the sequel. ...at least that's what I experienced. >.> So. To try and rephrase, the main events that occurred in A Game of Thrones (that will not continue on into the sequel) have their conclusions, but there's all these little subplots, in addition to some major revelations that leave you scrambling for your wallet and car keys to go get the next one. In short: Yes. The main points are as wrapped up as they can be for court intrigue, and you will absolutely want to go read the second. Jess - It wasn't difficult at all for me to keep track of the characters and the culture. Martin does such a great job of introducing everyone and the world he created, after a while they felt like old friends. Whoo, thanks for your input, Snickers! I'm definitely going to have to check this book out. Excellent. I'll have to add this one to my TBR. I've been wary of starting another fantasy book because the one (shamefaced it was only one chance I gave it!) I read just made me want to punch things.